I have been in Joburg for 9 years now, having relocated from Cape Town, and in a busy and cosmopolitan city such as this one, I totally appreciate the need for a view or a spot where one can watch the sun go down and still feel connected to nature, even if it’s just a glimpse of greenery. 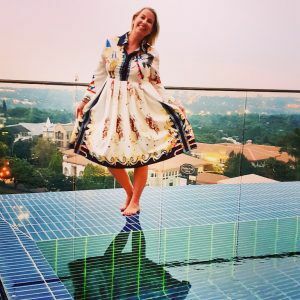 I recently spent some time with the team from Tsogo Sun (one of my fave hotel groups) to discover their top Sundowner spots in Joburg – each one uniquely distinct and offering the perfect location for celebrations, romance, meetings and special occasions. 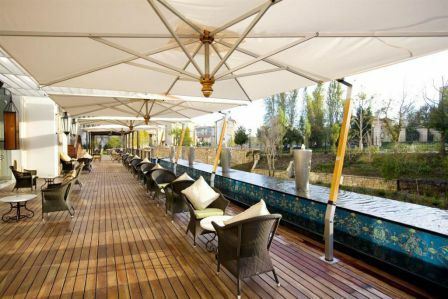 Our first stop was the beautiful pool deck at the Southern Sun Montecasino, which is inspired by 15th century Italy, and the elegant lounge area gives way to a one-of-a-kind deck overlooking an infinity pool and a waterscape inhabited by a family of swans. Make sure that the last Friday of the month is in the diary as they host Sundowners on the Deck, with live entertainment and a menu that features meze platters, pizza slices and sliders paired with a bespoke cocktail menu, including a distinctive selection of rum creations. Yum! 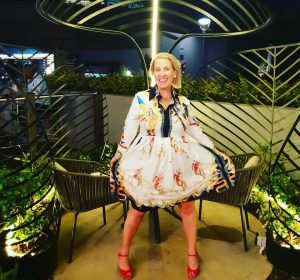 Next stop on our tour was the upmarket, and opulent Perrier Jouet Champagne Garden, which is located at the 54 on Bath Hotel in Rosebank. This luxury hotel offers a signature blend of luxury, style, and intuitive service that extends to its Champagne Bar and Garden. Perfectly positioned below a pool deck that almost spans the length of the property itself, 54 on Bath Champagne Garden’s enchanted ambience is unmatched and the view of trees and surrounding buildings is unparalleled. 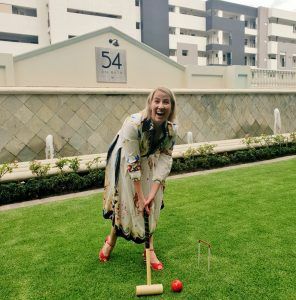 Sip on bubbles, play croquet and feel like you have escaped the hustle and bustle of the city for a little while! The popular Island Bar at Southern Sun Hyde Park was our third stop. This is one of my fave hotels, this view is just beyond incredible! Can you see why I just HAD to have a photo IN the pool! A carefully curated menu featuring light snacks and indulgent beverages await, with service excellence to match. Breath-taking panoramic views and a truly sophisticated setting in the heart of Hyde Park have made this the Best Sundowner Spot as voted by the public in the Best of Joburg Awards. The Friday Sundowner gets the weekend started with a line-up of top South African DJs each Friday from 16h30. Our fourth and final stop of the evening was The San Deck, the rooftop restaurant at Sandton Sun! This is certainly one of THE sundowner spots in the country with an extensive refurbishment and refreshed menu, created by Chef Gerard Vingerling. Set against the backdrop of the Sandton skyline and featuring social hubs, fire pits and seating designed for relaxation, this uniquely African meeting spot vibrates with the energy of the precinct and its people. The music complements the contemporary and energetic heart of South Africa’s business hub, and, come sunset, resident DJs deliver a pulsating Afrocentric beat. Tsogo Sun is the leading hotels, gaming and entertainment company in South Africa, providing a variety of hospitality and exciting entertainment and leisure experiences. Combining an established heritage with a professional and energised approach, the group proudly encompasses 13 casinos and over 100 hotels in South Africa, Africa, Seychelles and Abu Dhabi.